Press-ganged into helping a Russian oligarch hunt his missing daughter, PC Peter Grant and his boss, Thomas Nightingale, London's only wizarding cops, find themselves caught up in a battle between Russian gunmen, a monstrous forest creature, and their nemesis: The Faceless Man. But as Grant and Nightingale close in on the missing girl, they discover that nothing about this case is what it seems! 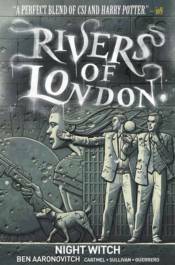 An all-new story that takes place before the new Rivers of London novel, The Hanging Tree!